1. The Life Line, which surrounds the Mount of Venus at the root of the thumb. 2. The Head Line, which joins the Line of Life midway between the root of the index finger and the thumb and stretches across the hand in a slightly downward direction almost to the percussion of the hand. 3. 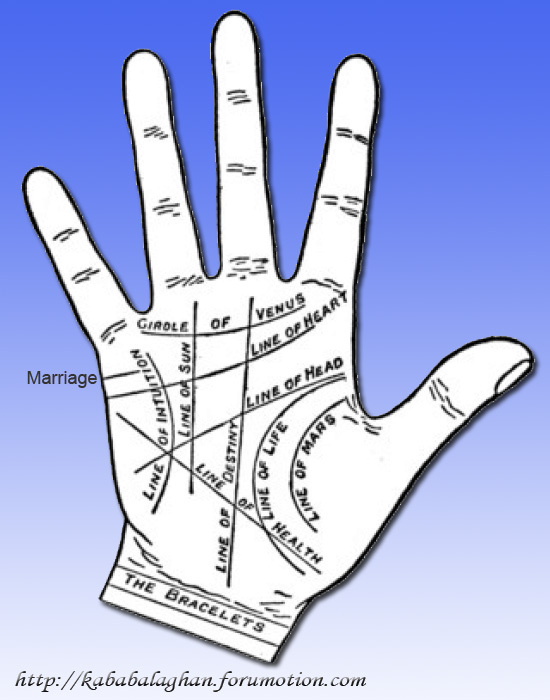 The Heart Line, which arises on the percussion of the hand below the Mount of Mercury and proceeds across the hand, terminating on or beneath the Mount of Jupiter. 4. The Girdle of Venus, which begins between the index and second fingers and follows a curved course, embracing the Mounts of Saturn and the Sun and terminating between the third and little fingers. 5. The Line of Fate, which has its rise at the wrist near to the end of the Life Line, and proceeds sharply upward through the palm, terminating on the Mount of Saturn. 6. The Health Line, which has its origin near the wrist by the Mount of the Moon and proceeds upwards to the Mount of Mercury. In addition to these there are found in some hands the Line of Fortune, arising in the palm of the hand and running upwards to the Mount of Apollo, and the Marriage Line, which arises on the percussion of the hand and crosses the Mount of Mercury. Finally, there is the Bracelet, consisting of one or more lines across the wrist immediately below the natural fold of the wrist at the root of the hand. The meanings of these lines will vary according to their length, definition and colour. When straight, single, deep and red they indicate all the best elements of character and destiny. The Head Line governs the intellect, the mental attainments and natural aptitudes. The Heart Line governs the affections and emotions, and has an equal influence with the Head Line over the fortunes. The Life Line shows the constitution, vital powers, and the probable duration of life. The Fate Line denotes the course of destiny, that which is inevitable, the stages and crises of life. The Line of Fortune has relation to honors, ambitions and attainments. The Girdle of Venus denotes the degree of sensibility possessed by the person. The Health Line shows the condition and probable course of the health.